On November 8, 2018, 37 enthusiastic fourth graders from the Arlington’s Randolph Elementary School explored the Dyke Marsh Wildlife Preserve with National Park Service staffers Brent O'Neill, Miguel Roberson and Susan Chumley, along with FODM volunteers. 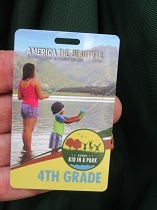 NPS gave each child a free "Every-Kid-in-a-Park" pass to enter all our national parks.The students were excellent observers, spotting bald eagles and snakes and they learned about plants and animals in the marsh using placards with images showing the biodiversity of the preserve. 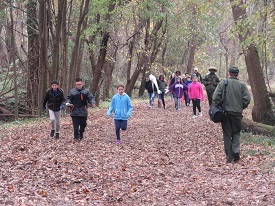 Two groups walked the entire Haul Road trail to the Potomac River using laminated guides on a nature “treasure hunt.”The rangers gave each student the Every-Kid-in-a-Park pass and encouraged them to explore our national parks with their families. On November 19 and 20, over 100 enthusiastic fourth graders from Alexandria's John Adams Elementary School visited Dyke Marsh. 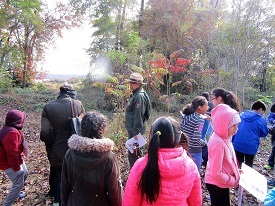 NPS rangers conducted several programs, assisted by FODMers and chaperones. Photos contributed by Glenda Booth (except first photo by Ned Stone). The rangers explored topics like earth processes, the food web and marsh inhabitants along the Haul Road trail. The fourth graders loved being out in the woods in the fresh air. 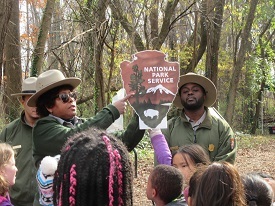 Jackie Cunningham Davis explained the NPS emblem (to her right, Ranger Kelly Clark). 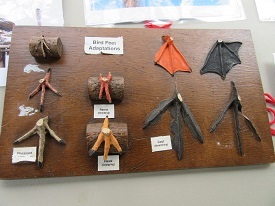 Students learned that birds' feet vary, have special adaptations. 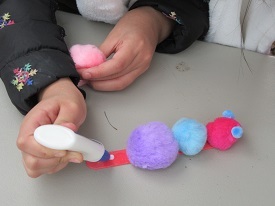 At one station, the youngsters made caterpillars and butterflies. 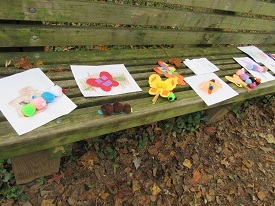 The youngsters' caterpillars and butterflies on display. 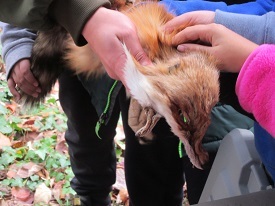 The youngsters loved touching animal pelts, here, a fox. 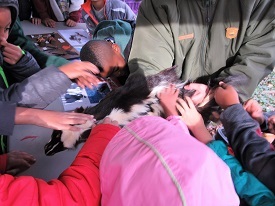 The youngsters got to feel another animal that lives in Dyke Marsh, a skunk pelt. 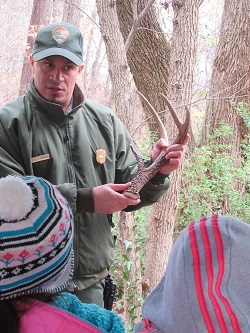 Ranger David Rodriguez explained that deer shed their antlers.